It wasn’t until disaster struck that Japanese American author Ruth Ozeki’s latest, critically acclaimed novel, “A Tale for the Time Being,” truly came to life. She had struggled with an earlier version of the story since 2006, eventually completing what she thought was the final version in 2011. “It just wasn’t a very good book, but at least I finished it. I was ready to send it in,” Ozeki said. Then the Tohoku earthquake hit Japan, followed by the tsunami and nuclear meltdown at Fukushima. Ozeki had lived in Japan as a young woman and has family and friends there. She was glued to the television set. Compelled to respond to unfolding events, she scrapped half of the already-written novel and went back to the drawing board. One of the changes she made was the addition of a character named Ruth, a Japanese American author who lives on an island in British Columbia, just as Ozeki does. She identifies the character as herself. “I just gave up and put myself in it,” she said, while also cautioning that the story is fictional. In the novel, Ruth finds some refuse washed ashore on the western Canadian coast, after the Japanese earthquake and tsunami. A plastic bag contains the diary of 16-year-old Nao, a Tokyo resident. Ruth, suffering from writer’s block, slowly works her way through the diary, discovering that Nao has a suicide wish, but first she intends to write a biography of her 104-year-old Buddhist great-grandmother. As the story progresses, Ruth’s and Nao’s fates become more deeply intertwined. 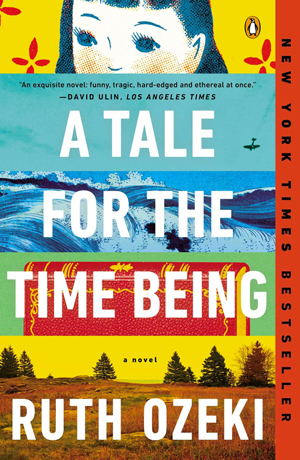 “A Tale for the Time Being” was a finalist for the 2013 Man Booker Prize. In contrast to the threefold Japanese disaster, there was also a more peaceful influence on the novel — Zen Buddhism, specifically, 13th century Zen master Dogen Zenji’s work. Ozeki became ordained as a Zen priest in 2010, and was involved in philosophical study of Zenji’s writings on time and temporality, while her novel was in process. The phrase “time being” is a direct translation of a concept he discusses. Her dedication to her religious practice has grown over the years. She made the decision to become ordained, in part, out of the desire to serve as an ambassador for Zen in the West. “So much of what I do in my writing is to sort of function as a bridge between cultures, and I felt that I could serve in that way for Zen practice as well,” she said. Ozeki draws parallels between writing and Zen meditation as contemplative practices. One place she found the calm necessary to make headway with “Time Being” was Hedgebrook, the women writers’ retreat on Whidbey Island. Ozeki was invited to a residency there in 2009. “I pretty much had decided I was no longer capable of writing novels and I should probably just give up,” she said. After three weeks in one of the rural Hedgebrook cottages, away from Internet connection, she had changed her mind. She was able to focus and her writing started to flow again. “I don’t think I would have finished this book had I not spent some time at Hedgebrook,” she said. Ozeki has written two previous novels, “My Year of Meats” (1998) and “All Over Creation “(2003). Both are tightly woven, plot-driven stories with Japanese American protagonists, and are centered around food-industry issues — meat production and genetically modified crops, respectively. Each of Ozeki’s three novels has a Japanese American female protagonist. By playing with these semi-autobiographical characters, she found her voice as an author. “I had this idea of what an American novel should be, and it was not something that I felt I could write,” she said. In 2015, Ozeki will begin teaching at the English department at Smith College, where she herself studied as an undergraduate. But while she looks forward to working with young writers, she is cautious about her own expertise. Ruth Ozeki will read from A Tale for the Time Being on Jan. 28 at the University Book Store, and on Jan. 29 at Third Place Books in Lake Forest Park. Signe Predmore can be reached at info@nwasianweekly.com.